The rapid transit system consists of 2 lines and the main line is split into 2 branches. 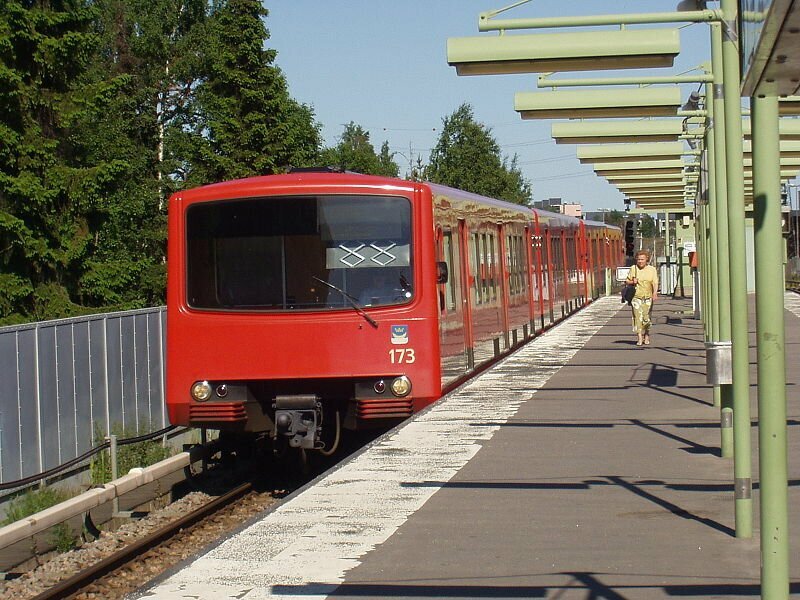 It serves 17 stations and begins operation from Ruoholahti towards Itakeskus. The first branch of the line runs north towards Mellunmaki, whereas the second branch runs south towards Vuosaari. It takes 22 minutes to travel between Ruoholahti and Mellunmaki . There are 9 stations which are built underground and 8, which are built above the ground. 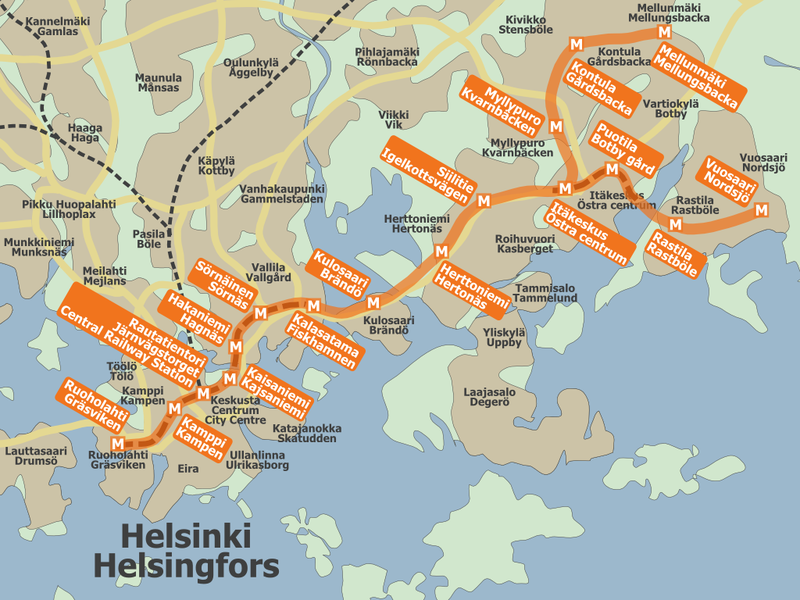 Map of Helsinki Metro showing various lines and stations. Click on the map to enlarge it or Download PDF. The metro services start at 5.30 am till 11.30 pm on Monday-Saturday. On Sundays, the operating timings are from 6.30 am to 11.30 pm. The frequency of trains on Ruoholahti–Itäkeskus is 5 min and during weekday peak times, it is 4 min. On Itäkeskus–Mellunmäki/Vuosaari, the frequency is 10 min, and during weekday peak times, it is 8 min. The total time, that the journey approximately take is 25 minutes. The travel area for the metro system is divided into 8 different areas. The names of which are as follows: Helsinki, Espoo and Kauniainen, Vantaa, Kerava and Sipoo, Kirkkonummi, Regional Ticket, Region two-zone and Region three-zone. Prices also differ for adults and children between the age group of 7-16 years old. Based on a combination of these two, the fares are decided. Further-more, the passengers have options between Single tickets for single trips, Day tickets for up to of 7 days and Travel cards for the regular passengers. For an adult a single ticket can vary from 2,50€- 10.00€, depending on the ticket. Whereas, for children the price of the ticket ranges from 1.60€- 10.00€, again depending on the type of ticket bought. The Day tickets too, depend on some similar factors, with one added factor, being the number of days. For a child, the price of the ticket varies from 4.00€ and goes up to 36.00€. Adults on the other hand, have slightly higher fares beginning from 8.00€ and going up to 72.00€. The metro allows certain perks for certain deserved people. Visually impaired people are allowed to be accompanied by guide dogs and there is no compulsion on them to display their travel cards to the card reader. Another perk being that a person can accompany such a person for free, provided the supported partner has their ticket. The metro allows for walkers and wheelchairs, to be carried inside the trains. Passengers on electric wheelchairs can travel for free. It’s made certain that comfort is ensured the people who are mobility impaired. On every train, seats are reserved for such people. Children between 0-6 years old, can make use of the metro service for free, along with their prams. The tickets need to be validated before entering the metro. If caught travelling with an invalid ticket, a rider can be charged a penalty of 80 euros and the price of a single ticket. An adult accompanying a child of 0-6 years in a pram/ stroller can travel free. Bicycles are allowed on metro during the off peak hours. Small pets are allowed to travel free. Most of the stations are disabled friendly as they are located on ground surface making them easily accessible to those with mobility problems. Escalators and lifts are also available on those stations that are sub-surface.